Sorry for the huge break in communication… I should be back for a bit now as I have finished work and been told to put my feet up. The creating didn’t stop you understand, just the energy to blog it! The pattern is from lion Brand Yarn. It’s US site so the patterns are in US crochet speak. They are free once you have registered with the site (which is also free). The original pattern has it as a catterpillar, but I just made it plain. I’m regretting not putting a bell or similar inside it though. 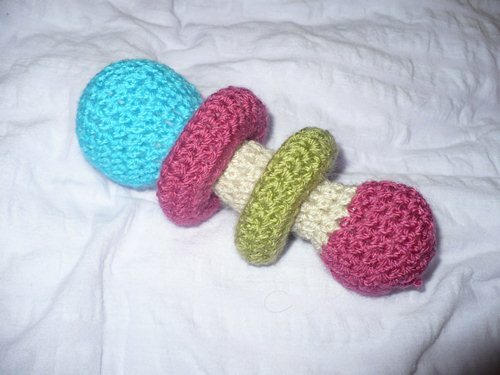 My baby would love this rattle, I’ve never thought of crocheting a rattle before. Well done, it looks really neat. That is so cool. 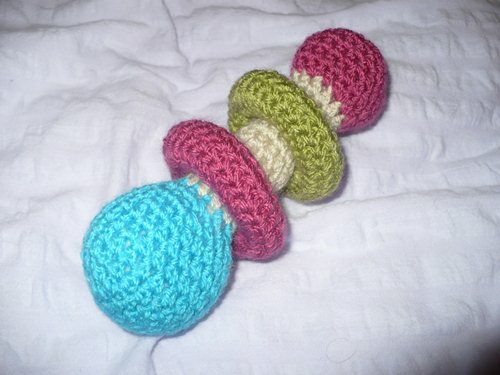 I had never thought of crocheting a rattle. What a great idea!!! It’s bright and colourful for baby, with a soft texture. Thanks for linking up. This is so gorgeous! I’m popping over to check out the pattern myself!